Svchost.exe or Service Host is an inbuilt process which runs continuously and it is one of the most important process in any Windows operating system. If you would have opened up Task Manager on your Windows 10, 8 or 7 pc you might have noticed that there are so many Svchost.exe processes running on your pc. You would also like to learn how to turn on Bluetooth on Windows 10. Below mentioned image is the screenshot of several Svchost process running on my Windows 10 pc. You can see that these each of these processes are consuming different amounts of memory and CPU. You might be thinking that you have never started these processes then how they get started and why they are running, why Svchost.exe CPU usage is so high. You may also become suspicious whether it’s a virus or is it safe for your system. I will answer all these questions which comes in your mind, but before that let me tell you that this post is going to get updated in future based on latest technological updates. So don’t forget to subscribe to my email list and bookmark this post for future reference. You would also like to check how to disable touch screen on Windows 10. This post is a part of several Windows processes located in Task Manager such as crss.exe, dwm.exe, taskhost.exe. If you are unaware of these processes then you can read all these posts to know more about them. What is Svchost.exe and why are so many running? Svchost.exe also called as Service host is a generic system process which helps to host several Windows services. These services are particular programs in a Windows operating system. It runs in the background when your pc is powered on. It uses dynamic link library (DLL) to serve its services. You would also like to learn how to delete temporary files in Windows 10. Several windows services are implemented in the form of dynamic link library. They can’t run as a stand-alone .exe file. They are dependent on Svchost.exe to load their services. 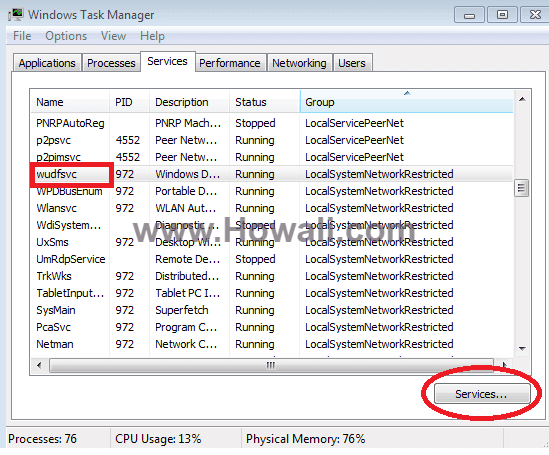 This is the main reason that you can see several processes of Service host running in the Task Manager. Also check how to recover lost password from Windows Live Mail. Is Svchost.exe a Trojan, malware or a virus? Svchost.exe is an inbuilt windows process that comes with installation of Windows operating system. It hosts several windows services and it is safe for your system. It can be found in Task manager under Processes tab. If you browse this path on your pc “C:\Windows\System32\Svchost.exe”, you will find the legit svchost file. But sometime it happens that with same name it can be found in other folder also and it can be considered a Trojan, malware or a virus. Also learn to fix Windows App Store is not working problem. How to remove Svchost.exe Virus from your PC? Sometimes Svchost.exe file gets infected due to a Virus or a Trojan attack. So in this case scanning your pc with a good antivirus or an anti-malware software helps. It will detect the corrupt Svchost file and automatically repair it or delete it if it’s a virus. Don’t try to delete the Svchost.exe file unless you are a system administrator or have good knowledge about it. By mistake if you delete the legitimate Svchost file than you may have to face system failure issues. Let this to be handled by a good antivirus software. It will do its best job to remove the virus and repair the corrupt file. Learn how to change System Language in Windows 10. You can fix the corrupt file by a simple reboot of your computer to Safe Mode. You should have admin privileges in order to play with the registry. So make sure that you have admin password before login. Also check how to enable developer mode in Windows 10. Make sure that you are deleting the file from the Temp folder and not from the System32 folder. If you don’t see svchost.exe file in Temp folder, then there is nothing to worry, just leave it as it is. But if you see Svchost.exe virus registry information, then remove it. Remote Desktop can't connect to remote computer - Learn how to fix this. Svchost.exe corrupt registry files can be fixed through a System Restore.You can restore your PC to a back date when your system was okay. This in an inbuilt system tool which comes with installation of your operating system. Check how to change background in Windows 10. 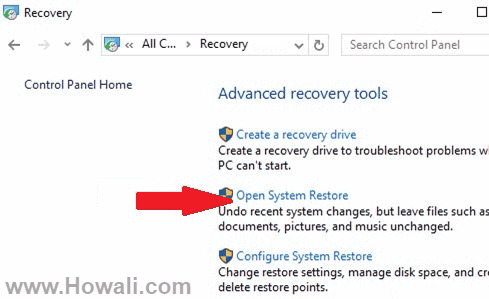 You can open System Restore option on your system by simply pressing the Start button and type System Restore in the search bar. Choose restore point date when your pc worked fine last time and start the Restore process. This will automatically fix the corrupt registry. Also check Absolute LoJack Coupon and get 45% Off. How to fix Svchost High CPU Usage? 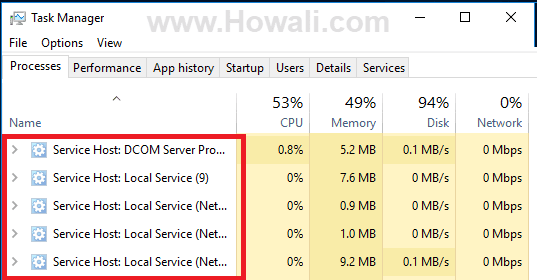 To fix Svchost High CPU usage you have to first find out which service is consuming high cpu. You can easily find out with Process Explorer tool from Microsoft. See below screenshot of Process Explorer for my pc. Once you have found out which Svchost service is consuming more CPU then you can easily fix it. Mostly Svchost process is a Windows process which is essential for smooth functioning of your system. But if you figured out that it is not a Windows process, then you can simply End it and uninstall the program from your pc to save CPU and memory. You would also love to check 36% off deal of DRPU Barcode Label Maker discount coupon. 1. Right click on your Taskbar and select Start Task Manager. 2. In Processes tab check the box next to Show processes from all users. 3. 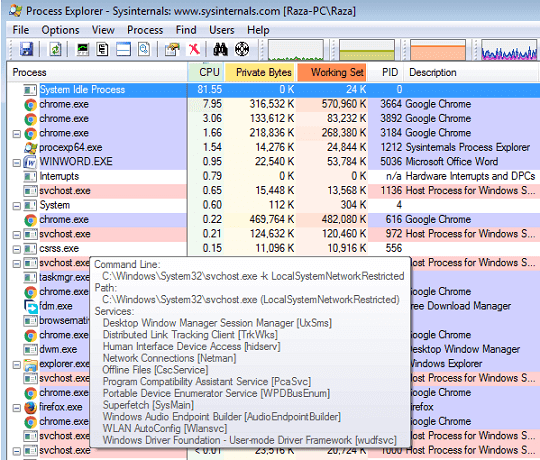 Right click on Svchost.exe with highest usage and choose Go to Services (s). 4. In Services tab you will see several processes of Svchost.exe highlighted with their Name, PID, Description, Status and Group. 5. You have to find out which Svchost service is hogging CPU resources and stop that service. For example in the below image I have shown about how to stop wudfsvc service. Click on Services as shown below. You would also love to check 123FormBuilder Discount Coupon. 6. 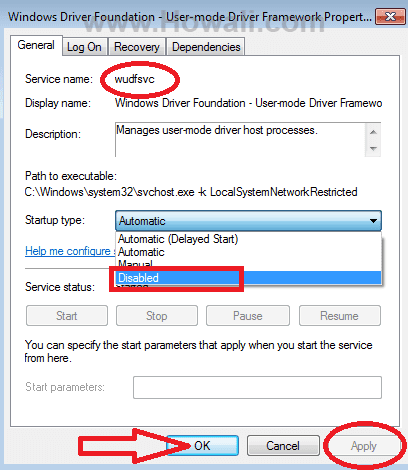 Locate and right click on Windows Driver Foundation as shown below. 7. 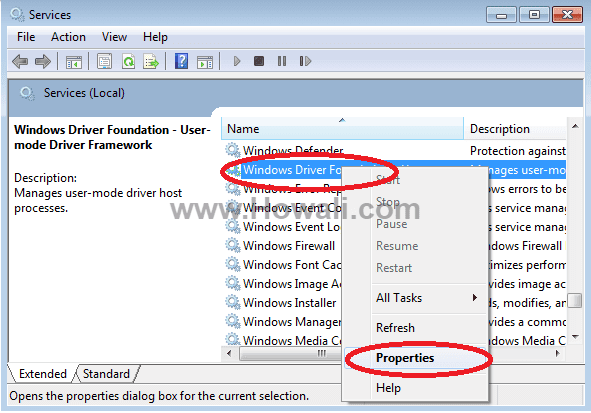 Click Properties of Windows Driver Foundation as shown above. Also get 17% off with SEO Powersuite Discount Coupon. 8. You can match the Service name shown in step 5 with step 8 as shown below to confirm that you are playing with the right services. 9. Select Startup type as Disabled to stop the service completely. You can turn it on again by selecting Automatic. 10. Finally click Apply and OK and you have successfully stop the service. You might also love to check 17% off deal with LinkAssistant Discount Coupon. So these were the methods by which you can fix Svchost.exe High CPU Usage, remove virus and fix registry errors. Do let me know through comments how this post has helped you. Don't forget to subscribe to my email list to receive more useful tips of this blog in your Email. If this post has helped you, then please give us a Facebook like below. I would also request you to share this post with your friends from the social network buttons given below.